6.8 mm SPC Cartridge History & Development. Hornady's Ammunition. The Stag Carbine. This article has 16 pages. You're on page 1. 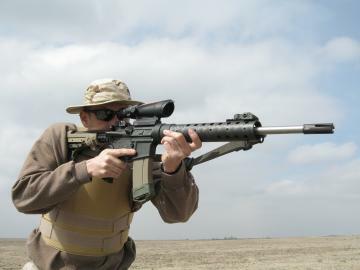 The light weight and compact size of the 6.8 SPC carbine, opposed to a .308 battle rifle, is appreciated when carrying the rifle afield and employing it quickly. 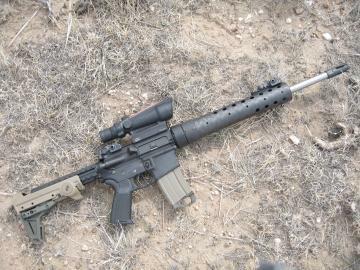 Since the M16's introduction, soldiers, sailors, airmen, Marines and civilians have criticized it for being underpowered, more suited for shooting prairie dogs than fighting wars. Although ammunition has improved, the 0.22-inch caliber ultimately limits the amount of lead that can be slung down-range. In spite of this, the M16 and M4 have become the standard by which assault rifles are judged, and the AR-15 has become the ubiquitous American Sport-Utility Rifle. Just as the War On Terror was getting underway, the U.S. Army Special Operations Command (USASOC) created the Special Purpose Rifle - Variant (SPR-V) program to fill the need for a modular assault rifle capable of shooting 5.56 in addition to 7.62x39mm. With barrel and bolt switched, it was to fire 7.62x39mm from indigenous AK-47 magazines. It needed to retain the characteristics of the M4 and remain compatible with the Special Operations Peculiar Modification (SOPMOD) accessories. Robinson Armament produced the RAV02 and Knights Armament Corp produced the SR-47 in response to the USASOC SPR-V solicitation. Ultimately, the SPR-V program was rolled into the U.S. Special Operations Command (USSOCOM) Special Forces Combat Assault Rifle (SCAR) project, and fell victim to politics. The author's rifle is built on a standard lower with a Magpul M93B stock, 18" Douglas barrel, TA11 ACOG, Troy back-up sights, PRI GenIII float tube and Vortex flash hider. Even though the project was canceled, Special Forces soldiers had come to realize 7.62x39mm provided increased lethality over 5.56, especially when penetrating barriers. Troubling reports about 5.56's performance were coming back from the field. Several soldiers had been killed or wounded by Taliban fighters who had already been shot multiple times by the Americans' 5.56 M4 carbines. These failures to incapacitate spurred the 5th Special Forces Group (SFG) to design an "Enhanced Rifle Cartridge" (ERC) to outperform 5.45x39mm, 5.56, 5.8x42mm and 7.62x39mm. MSG Steve Holland (5th SFG (A)) and Cris Murray of the U.S. Army Marksmanship Unit (USAMU) led the ERC project to provide optimum terminal performance from an M4 with minimal changes to the weapon. Troy Lawton (Chief Ballistics Technician) and Cris Murray (Service Rifle and R&D Gunsmith) of the USAMU assisted in developing loads, and built the rifles for the ERC project. Cartridge assessment began with the 6mm PPC case, necked up to 6.5mm. The 5th SFG soon discarded the fat PPC case due to poor magazine capacity and insufficient reliability in the M4. Their attention then turned to the .30 Remington case, which is essentially a rimless .30-30 Winchester. Its head and body diameters are larger than 5.56 (0.378 inch), but smaller than 7.62x39mm (0.445 inch). This thoroughly obsolete cartridge was chosen as the parent case because its smaller head diameter (0.422 inch) required less metal to be cut from the bolt head compared to the PPC or 7.62x39mm cases, which improves bolt service life. Several rebated-rim prototypes were created with an SPC body but 5.56's rim (0.378 inch) to utilize unmodified M4 bolts. After trials, it was clear the full-diameter rim helped extraction as compared to the rebated rim design.